As Britain embarks on its journey towards the exit from the European Union, the Anglo-German relationship is bound to play a central role. No other country is likely to matter more for the outcome of the negotiations than Germany, one of the UK’s most reliable partners in recent years. So how should we now think of this relationship which has defined modern Europe? In trying to find an answer it makes sense to consider the nineteenth and twentieth centuries in one context. We have grown accustomed to a narrative that uses the period before the First World War as the mere foil against which to narrate the ‘rise of antagonism’, a dramatic shift from friendship to enmity. Yet throughout the Victorian age Britain and Germany were neither joined in comprehensive alliance, nor locked in conflict: politically speaking, they were neither friends nor foes. Under Bismarck and Salisbury this was a partnership which expressed both dependence and distance: dependence because London and Berlin shared underlying interests and co-operated effectively; distance because they were unable to come to a formal agreement which would have given the Anglo-German relationship a more long-term basis during the second half of the nineteenth century. What took place in the decades before the First World War was not an inevitable shift towards enmity, but an increase in both co-operation and conflict. While the image of two hostile nations facing each other across the North Sea came to dominate in public discourse, Britain and Germany had in fact reached unprecedented levels of mutual dependency. The two nations’ wealth were interlinked: it was by trading with the other country and by co-operating in global markets that Edwardian Britain and Wilhelmine Germany prospered. A dense web of mutual ties linked the two nations not only economically, but also through a myriad of cultural and scientific activities, which included engineering, education, research, publishing, architecture, music, and literature. The naval race and a series of diplomatic blunders established a new language of enmity in the decade before 1914, but it did not alter the two countries’ underlying interdependence. On the contrary: at the height of political conflict the two countries were more closely bound up with one another than ever before. It is the second half of the nineteenth century, rather than the traumatic period of the two world wars, which is likely to hold clues for our understanding of the latest transformation of the Anglo-German relationship. What characterises both countries today is again a high degree of mutual interdependence. Economically and culturally Britain and Germany are more closely bound up with one another than at any other point in the modern period. Crucially – and this is the main difference to the nineteenth century – this applies also in a geopolitical sense: the two nations are firm partners in a global alliance dominated by the US. The European Union has translated this political partnership into a vast range of structures which have facilitated the entwining of British and German societies. All of this has made co-existence and interdependence so much of an every-day fact that it has become difficult for younger generations to appreciate just how conflict-ridden and violent the Anglo-German past was in the first half of the twentieth century. It remains to be seen in how far the British exit from the European Union will loosen the ties that bind the two countries together. Crucial to the outcome will be in how far the British government feels compelled to restrict the freedom of movement from which its own citizens and those of the EU have benefitted over the last few decades. Nothing has shaped the Anglo-German relationship more consistently through the past two centuries than the fact that people never stopped moving between the German and English-speaking parts of Europe. The few periods during which one or both of the two countries tried to put a stop to exchange and movement were periods of unprecedented instability or violent conflict. If there are any lessons to be drawn from this relationship as it has developed over the past two hundred years, it is this: just as Germany is unable to control an increasingly unpredictable Europe, Britain will be unable to escape it. Featured image credit: “Kultur ist great” – advertising Great Britain in Germany by Richard Allaway. CC-BY-2.0 via Flickr. Jan Rüger is Professor of History at Birkbeck, University of London. He is the author of The Great Naval Game: Britain and Germany in the Age of Empire and joint editor of Rewriting German History. 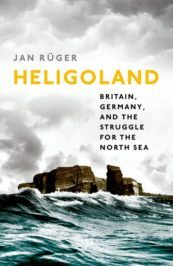 His latest book is Heligoland: Britain, Germany, and the Struggle for the North Sea (OUP, 2017).